OK, I admit this is more of a female give-away item, but don’t worry, you guys will have your chance. Since I’ve primarily been working from home for the past six years, I don’t need to get dressed up very often and that’s fine with me. It saves time and money spent on a professional wardrobe. But…I’ve never pruned the clothes I used to wear to work from my closet. Skirts are the beginning. 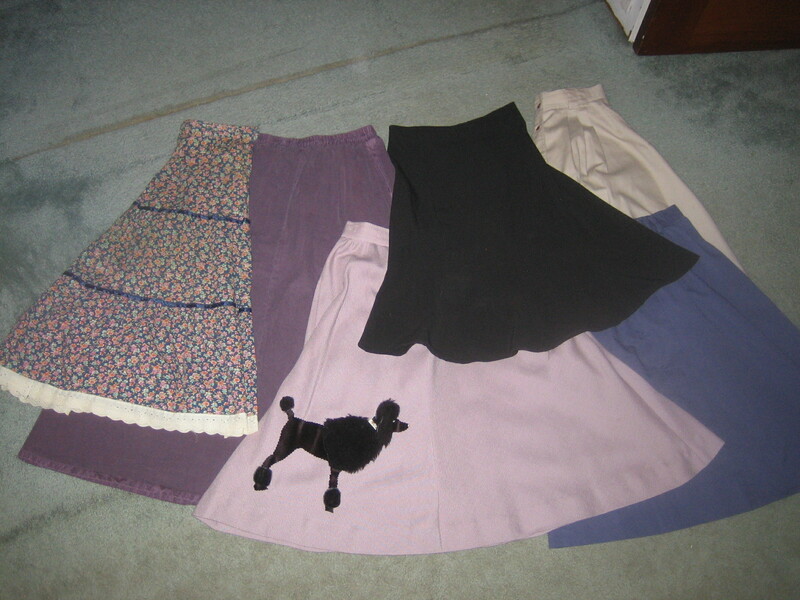 Although I have sentimental attachment to some skirts, I have to admit choosing to get rid of some was not a difficult decision. They were pretty outdated anyway. #1 | Written by Heidi about 9 years ago. Oh come on, that wasn’t your poodle skirt! That was the poodle skirt that you made me for a Halloween costume. I’ve noticed a few of my old clothing items in the clothing that you are supposedly sacrificing (for example, seersucker blazer). On another note: I want the flowered, lace-trimmed skirt! Save that for me! You make a good point and in fact I hesitated because I’ve been saving the poodle skirt for just such an occasion (or a Halloween party). I may regret this decision. That’s why for now I’m just storing the “stuff” in a corner in case I change my mind, but there’s only so much memorabilia I want to continue to keep. #3 | Written by Scottie about 9 years ago. 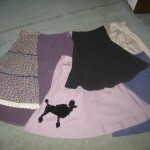 Don’t give away the poodle skirt! It’s a classic from teen years. My daughter actually made one for our grandaughter last year for a 50’s party. Think of the time money and fabric that would have been saved if I had kept mine.